Southern Governor Shaikh Khalifa bin Ali bin Khalifa Al Khalifa attended a reception ceremony held by the Japan-Bahrain Economic Cooperation Association (JBECA) on the occasion of his visit to Japan. He was welcomed by the association’s Board Chairman Koichi Kawana, Bahraini Ambassador to Japan Ahmed Al Dusari, Japanese Ambassador to Bahrain Hideki Ito, businessmen and representatives of Japanese companies. The JBECA Board Chairman hailed the Southern Governor’s visit to Japan, describing it as an opportunity to further boost bilateral relations mainly in the economic field, especially after the visit of His Majesty King Hamad bin Isa Al Khalifa to Japan in April 2012. He thanked the Southern Governor for his support to JBECA which helped it achieve its goals. 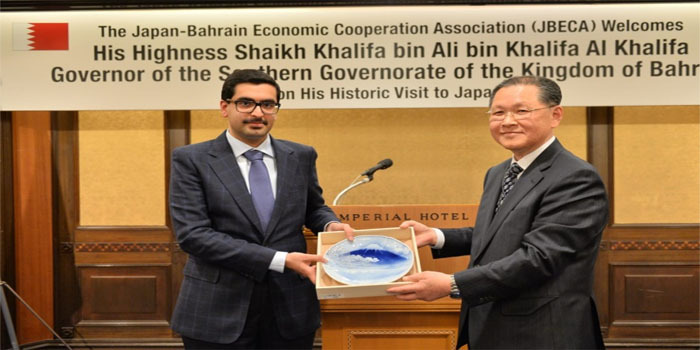 The Southern Governor praised the role of the Japanese businessmen in promoting bilateral economic relations, stressing Bahrain’s keenness on fostering cooperation with Japan given the investment and economic importance of both countries. He also wished JBECA every success in opening new horizons of joint work. Former Japanese Ambassador to Bahrain Kiyoshi Asako praised the role of the Southern Governor in consolidating friendly relations between both countries and supporting joint projects.